What you are about to read is my family’s actual Christmas letter from 2008. I’ve written about it many times before, but never before on this blog. Many of my readers might well remember “The Great Christmas Card Fiasco of 2008” and perhaps even followed my woeful tale on Facebook. If you have heard or read this story before, then I hope you won’t mind rereading it again. Maybe it will even bring a smile to your face as you relive a Christmas past along with me. However if you’ve never heard this me tell this tale, then may it bless your heart as much as God has used it to bless mine over the past 6 years. And if you laugh, don’t feel bad. It’s one of those memories I love to laugh about now, even though at the time it certainly wasn’t very funny. Have you ever felt like things were going wrong at every turn, and that no matter how hard you tried things just didn’t go according to your plan? Perhaps you can relate … but if not, please bear with me while I tell my story. Earlier this month I ordered Christmas photo cards. From the start, it all seemed to go wrong. I placed my order online, and discovered soon afterward that the company I used was brand-new. They were overwhelmed with many more orders than they expected, and so were unable to process my order in a timely manner. Once my order finally got shipped, winter weather kept delaying the cards as they slowly made their way to my doorstep. Originally I was supposed to have received my cards by December 10th, which would have given me plenty of time to address and mail out the cards in a timely manner. However, as my luck would have it, the cards didn’t show up in my mailbox until the afternoon of December 22nd. I was already somewhat upset about the lengthy delay, so imagine my shock when I opened my package and saw the the Christmas photo cards I ordered had arrived minus the photo! Who ever heard of a Christmas photo card without the photo?!? I was livid! In that moment, all of my Christmas joy seemed to have been zapped away. The more I thought about it, the more the situation seemed dire and bleak. It was too late in the day to call the company; too late in the season to order new Christmas cards. I felt as if the entire world was working against me mailing out a few Christmas cards. My heart was filled with a hopeless dismay. Well, after the hot angry tears were all wiped away and a good night’s sleep had given me a new perspective, the thought occurred to me that maybe Joseph felt like the world was working against him on that very first Christmas. I wondered what thoughts and emotions went through is head as he tried and tried to find a safe place for Mary. And when he could find no room in the inn and had to take refuge in a barn, did he question himself as to why this was the best he could manage to do for his wife and the newborn Son of God? It seems unlikely that Joseph had first-hand knowledge that it was God’s intention for the King of Kings to be born in a lowly stable. Maybe he did, but I have a feeling that Joseph felt a lot of dismay and frustration with the situation. Obviously my situation didn’t have nearly the same level of urgency as what Joseph must have experienced. After all, as awful as it seemed in the moment, “The Great Christmas Card Fiasco of 2008” is far from being the worst thing that has ever happened in the history of mankind. In fact, it’s not even close to being the worst thing that has ever happened to me. Truthfully, I can’t even really say it was bad because in the end the company apologized for their terrible mistake and gave me a full refund on the cards, which is honestly the best thing they could do under the circumstances. 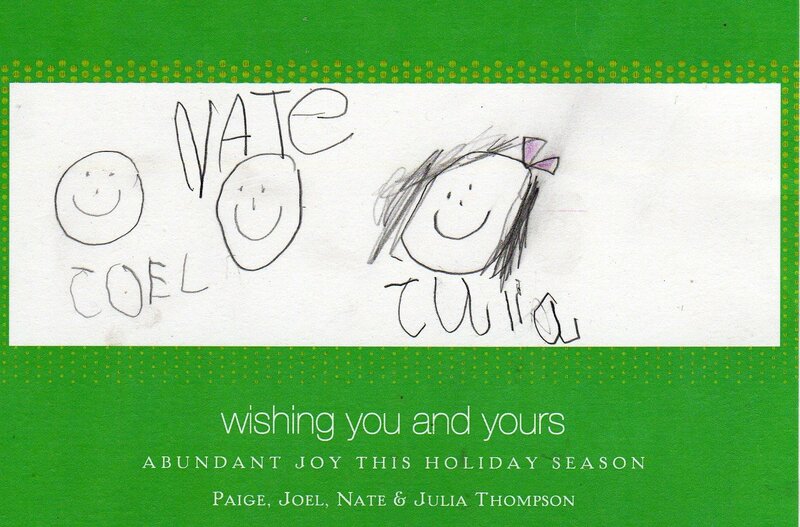 And even though this is definitely not the card I had intended to send to all of my loved ones, my sweet children were very eager to help me make lemonade from the lemons thrown our way by drawing pictures of themselves into the blank photo spot so that the cards weren’t a total waste. Free Christmas cards can’t be all that bad! So maybe this won’t be the best or most beautiful Christmas card you receive this season, but I imagine it will be the most unforgettable card. I’m hoping to send out real photo cards sometime this spring, but until then the kids and I hope you will enjoy this original creation from our house. 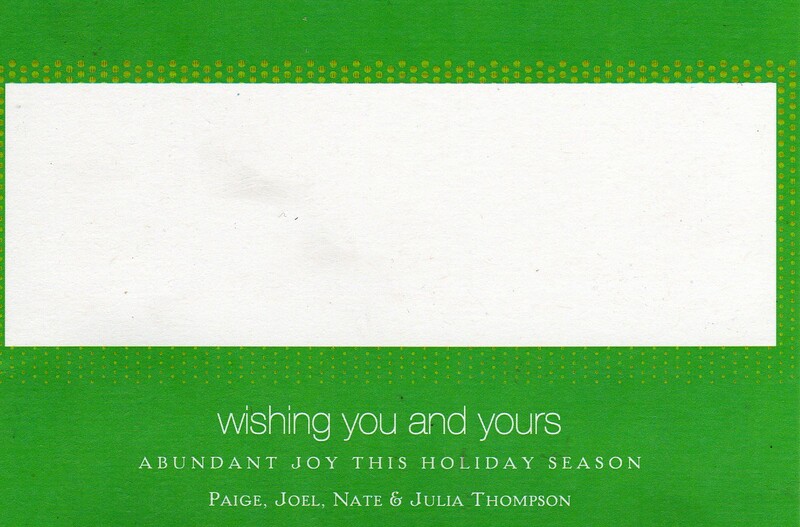 May your home be filled with peace and joy … and may your hearts stay merry and bright throughout 2009! sponsored by The Artistic Christian blog. What a fantastic Christmas story… I’m so glad you shared this one again! I can’t imagine how frustrated you must have been with that company, but I think the cards turned out beautifully… I bet they really stood out among all the “regular” cards that everyone received that year! Thanks for entering the Christmas Memory Contest! One thing I’m certain of is that our cards were one-of-a-kind that year! it was a very sweet sort of lemonade, Diane! I enjoyed reading this story, and smiled the whole way through. I love the way kids don’t see the frustration or situation like us adults. I can picture them having a blast coloring these cards while you’re fuming in the other room. I admire my kids for this. Everyday I’m trying to be more like them and remember that I’m a kid too–God’s kid. Thankfully, I managed to enjoy the moment with them the next day … but the day before my temper was flaming hot! Ouch! Yes, I still have a lot to learn.Ha! I remember those cards! In fact, we kept that one because I loved how you turned the situation into something to treasure! What a great testimony to how all things work together for good for those who love God! What a sweet story! you made me smile! Congratulations on winning the Artistic Christians contest with this story!! I absolutely would have loved receiving your cards, they are perfect! Thank you! I always pull those cards out at Christmas to remind myself of it.